CJC Off Road Blog: Spring Update! This 2014 Ram Mega Cab 2500 featuring a Carli Suspension 2014+ Pintop 2.5 system is one of the best riding trucks we have ridden in. Featuring factory 20" wheels and 37" Nitto Terra Grappler G2 tires, this truck is smooth both on and off road. This Ram 2500 came to us from Arizona and was upgraded with a Carli Back Country 2.0 system and Toyo Open Country R/T 35" tires. The owner wanted a setup that would ride better than stock and wouldn't bottom out easily on Arizona dirt roads. This setup fits the bill perfectly! This 2011 Super Duty was upgraded to a Carli Suspension Commuter 2.0 upgraded with Deaver full progressive rear leaf springs. The difference in ride between the stock springs and the Carli setup was night and day. Cracked asphalt, dips, and speed bumps are barely felt inside the cab! Our resident destructive tester's truck is back up and running! 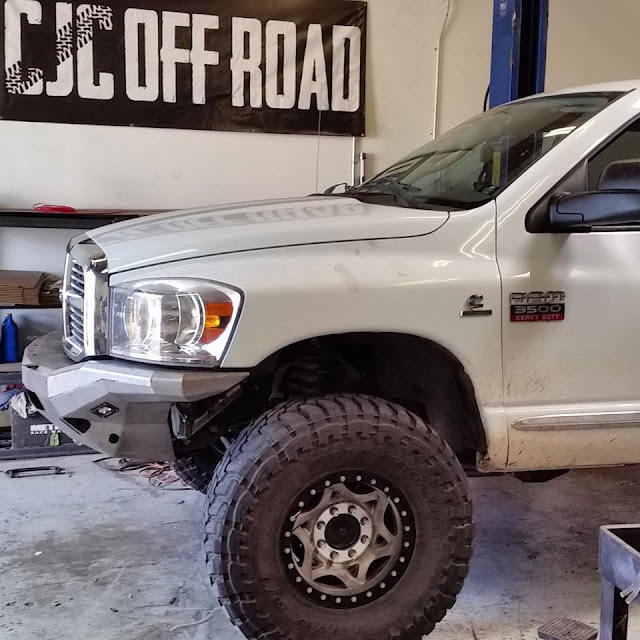 Featuring a Carli Suspension Unchained 3.5 system, Synergy long arms, and Synergy heavy duty steering, this truck is now looking better than ever thanks to Mercenary Off Road front and rear bumpers!